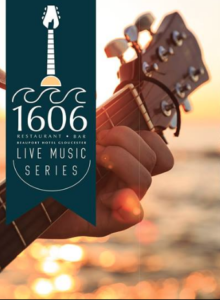 Head over to Beauport Hotel every Wednesday and Thursday to the 1606 Bar from 7:00 pm to 10:00 pm for their live music series featuring local artists! With full bar bites and dinner menus available, a 44-seat bar with lounge, couches, fireplace, and widescreen TV’s, 1606 is a great spot for all to enjoy local live music. There is no cover fee, and complimentary self or valet parking is available. 1606 Restaurant & Bar is located on the lobby level of Beauport Hotel Gloucester at 55 Commercial Street in Gloucester, Massachusetts.